The Gizmo 3D allows you to apply a move, scale or rotate transformation to multiple SubTools at once. This multiple SubTool manipulation is only possible with the Gizmo 3D — other actions like sculpting or applying deformers to a selection of multiple SubTools is not possible. To transform multiple SubTools at the same time, you first need to enable the “Trans­form All Selected SubTools” mode found at the top of the Gizmo 3D. When the Gizmo 3D is in this state, all visible SubTools can be manipulated with the Gizmo 3D as a unit. If you decide to use another ZBrush function like ZRemesher, an Inflate deformation, or adding a subdivision level, only the current SubTool will be affected. All the top parts of the car are moved and rotated together with the Gizmo. A quick and easy way to manipulate multiple SubTools is to use the visibility settings found in the SubTool list. Only visible SubTools will be affected by the Gizmo 3D. Unfor­tunately, this can break your SubTools visibility organization. CTRL+Shift+ click on the SubTools of your choice to select them. Unselected SubTools will be displayed with hash lines. CTRL+Shift+click again on a selected SubTool to remove it from the selection. At any time, use the Gizmo 3D manipulator to move, scale and/or rotate your current selection. CTRL+Shift+click on any empty space in the canvas to invert the temporary selection. Hold CTRL+Shift and do a click and drag on an empty space of the canvas to clear the temporary selection. Note: Solo mode is not affected by the Gizmo3D Transform All Selected SubTools mode. From left to right: The DemoSoldier without a selection. 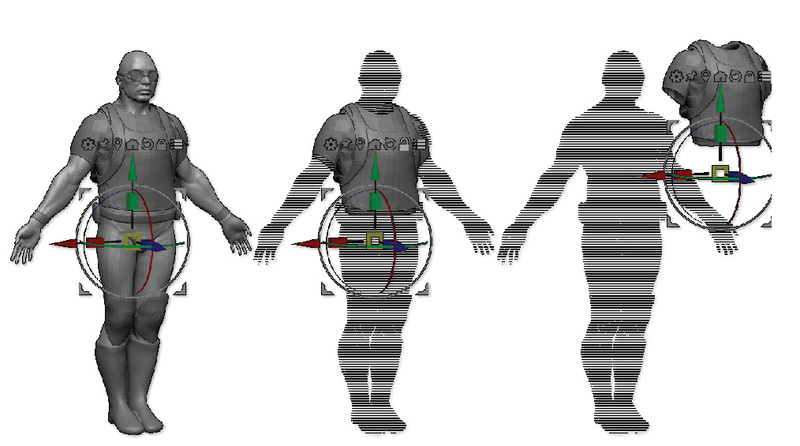 The Shirt, Vest and Backpack SubTools are selected. The selected SubTools are moved as a unit.